This beautiful poster was published by Fraipont et Moreau, 95 rue de Vaugirard, Paris in 1893. Its original size was 139 x 100cm. The illustration and design was the work of Gustave Fraipont (1849-1923) and is one of numerous designs he did for Railway Companies operating in the West and North of France. The title of this poster is : “Chemin de fer d’Orléans. Excursions en Touraine et aux châteaux des bords de Loire”. It is part of the on-line collection of digitalised images at Bibliothèque nationale de France. For me it’s a beautiful way of incorporating all the info you need to get across while still making an attractive piece of public art. This entry was posted in 19th Century Touraine, Amboise, Artists, Chambord, Loire River and Loire Basin, Transport ~ roal. 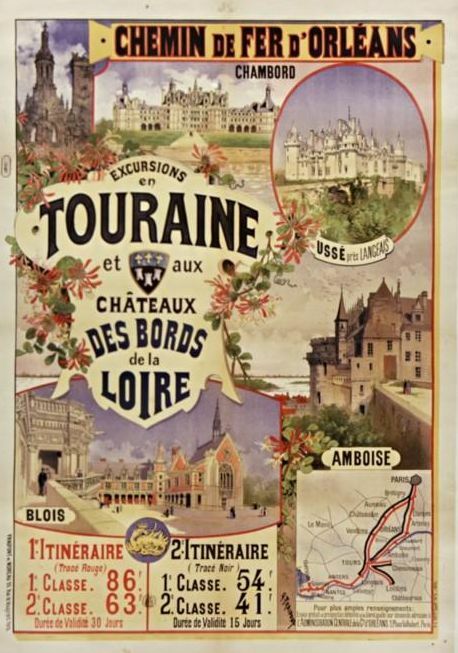 rail, water, Ussé and tagged Amboise, Blois, Chambord, French railways, Gustave Fraipont, Loire Valley, Loire Valley History, Railway Posters, Touraine, Touraine History, Touraine map, Ussé. Bookmark the permalink.